672 pages | 295 B/W Illus. 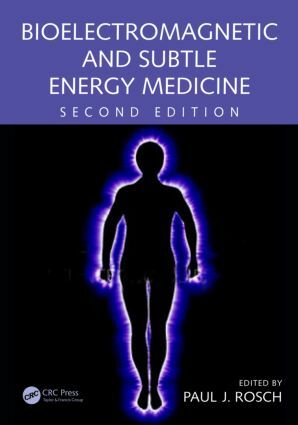 Bioelectromagnetic and Subtle Energy Medicine focuses on a wide variety of evidence-based bioelectromagnetic and subtle energy therapies for disorders ranging from cancer, cardiomyopathy, and Parkinson's disease to depression, anxiety, and pain. Since publication of the first edition more than a decade ago, there have been so many advances in these and other diseases, that a thorough revision is required for this resource to remain the gold standard in a burgeoning field. This second edition updates previous topics and features many new chapters describing novel approaches that promise to replace drugs or surgery because they are more effective and much safer, such as rTMS for depression, MRI-Guided Focused Ultrasound for bone and uterine tumors, and TheraBionic LEET for liver cancer. Others discuss biological water (H3O2) that acts like a battery, health benefits of Earthing, malignant and other brain tumors from cell and cordless phones, visualizing and measuring energy fields in humans and nature, making sense of homeopathy and "memory of water," basic science support for acupuncture, electrosensitivity, ion cyclotron resonance, the role of the pineal gland, the health effects of solar storms and terrestrial influences, and why Bioelectric Resonance Therapy bridges Chinese and Western medicine. This is only a sampling of the 50 chapters contributed by authorities from the United States, Europe, Scandinavia, Russia, China, Japan, and Iran. "The book, written and edited by researchers in the field, is a thought-provoking addition to the medical literature. … Some of the sections are really excellent reviews of the literature. … Weighted numerical score: 66 - 2 stars." "…readers will discover a treasure trove about the known and the mysterious energies and forces of life in all biological systems. Each chapter is bound to inspire heightened research resulting in advanced insights designed to provide real benefits toward optimal attainable health of people everywhere." Paul J. Rosch, MA, MD, FACP, is a clinical professor of medicine and psychiatry at New York Medical College, Valhalla, USA. He is also chairman of the board of The American Institute of Stress and honorary vice president of the International Stress Management Association. Dr. Rosch is a fellow and life member of The American College of Physicians and an emeritus member of the Bioelectromagnetics Society and Endocrine Society. He has served as president of the New York State Society of Internal Medicine, president of the Pavlovian Society, and expert consultant on stress to the United States Centers for Disease Control and Prevention. He has been the recipient of numerous honors in the United States and abroad, including the Innovation Award of The International Society for the Study of Subtle Energies and Energy Medicine, the Outstanding Physician’s Award of the New York State Medical Society, and The I.M. Sechenov Memorial Medal from The Russian Academy of Medical Sciences.